Reduces need for smoking, contains Nicotin. 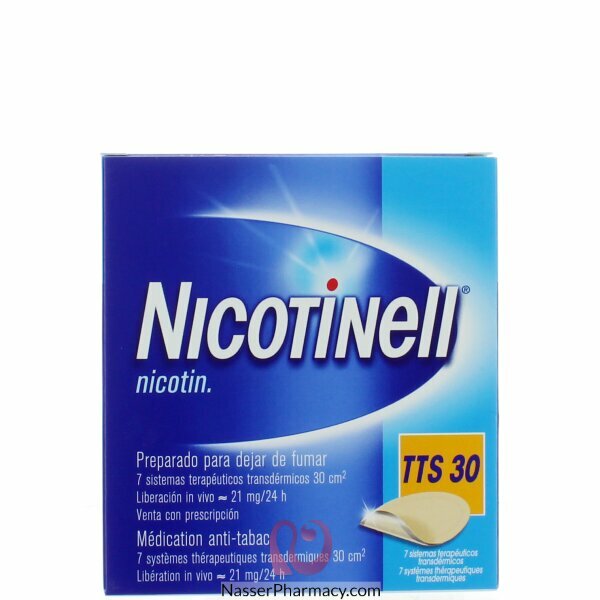 Nicotinell patches contain enough nicotine for 24 hours of treatment when you stop smoking. We recommend that you use Nicotinell patches all day for the best control of morning cravings. And using them for 24 hours, means that when you wake up you’ll have nicotine in your blood so you’ll be ready to face the morning cravings more easily. Nicotinell patches are available in three strengths, 10, 20 and 30 TTS based on your individual needs. The dose you start with depends on how much you smoke per day. Nicotinell patches are sold in packs of 7. We recommend that you use Nicotinell nicotine patches around the clock and put on a new patch every morning when you remove the old one. You can use the patch on your upper arm, upper back or hip. Ensure that your skin is unbroken, dry and hair-free. Smooth out the edges of the patch to ensure that it adheres properly. Choose a new spot every day and do not use the same spot again for at least seven days. When the patch is adhered to your skin, it releases nicotine. Nicotine can irritate your skin, so you may notice red marks when you remove the patch. The redness usually disappears after a few days and is not dangerous. If your skin feels itchy or if you notice blisters forming, then you should stop using the patch immediately, since this can indicate an allergic reaction to the nicotine or the adhesive. Please read the leaflet enclosed in the pack and make sure you follow the instructions carefully. STREPSILS EXTRA BLACKCURRENT 24 SFor pain relieving of sore throat. Str..
Copper is an essential trace mineral. It is essential for the formation of collagen that helps suppo..